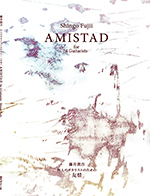 AMISTAD was originally composed as the ninth and final movement of “Music from Friends”, written for Flute Orchestra in 2006. In 2009 the piece was adapted and rewritten for Guitar Quartet. The inspiration for the music is the fable of the Lion King, who, doubting the faithfulness of his friends, invites them to a party to test their devotion. The spirit of the finale brings out the joy of true brotherhood, and carries the title “Amistad”, which means friendship in Spanish. It is dedicated to four of my good friends, the guitarists R.Matsushita, S.Ikeda and R.Takeuchi, and L.Bravo.